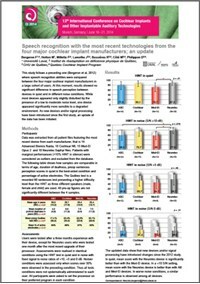 An independent study carried out at the University hospital in Quebec, Canada on the latest technology from the four major cochlear implant manufactures, clearly shows that the Saphyr neo collection sound processor gives better results for its users when it comes to speech understanding in quiet and in noisy situations. These results confirms other studies done on this new advanced sound processing. Oticon Medical has obtained 510(k) clearance from the U.S. Food and Drug Administration (FDA) to market Ponto Plus, our newest family of bone anchored sound processors. New Ponto Plus is available in regular and power versions that feature a new transducer, Inium feedback shield and new wireless capabilities. The new sound processors are designed for use with Oticon Medical’s proprietary OptiFit™ and OptiGrip™ implant design concepts that have also been cleared by the FDA for use in tissue-preserving surgery. Built on the Inium platform, the latest chip technology from Oticon Medical’s sister company Oticon, the Ponto Plus family features a new powerful transducer, an efficient and innovative Inium feedback shield and the newest Bluetooth 2.4 GHz wireless technology, all designed to deliver better sound quality, less feedback and fewer artificial sounds. Innovative wireless capabilities make it possible to connect Ponto Plus directly to smart phones, to loop systems in public venues and to other modern communication devices to allow conversation, music and other sounds to transmit from the Ponto Streamer directly to the sound processor. Used in combination with Oticon Medical’s proprietary OptiFit™ and OptiGrip™ implant design concepts, Ponto Plus supports exciting new tissue-preserving surgical possibilities for clinicians to increase long term prospects and well-being for new and experienced users of hearing implant technology. Available in regular (down to a hearing loss of 45 dB) and power versions (down to a hearing loss of 55 dB), Ponto Plus is the most powerful ear-level bone anchored sound processor family. The optimized design of the transducer increases the maximum output in the mid and high frequency range to reproduce louder sounds so that users can enjoy more everyday sounds without the sounds becoming distorted. Ponto Plus users can enjoy communicating in a wide variety of situations, all controlled through one user-friendly device. The addition of the new Ponto Streamer turns Ponto Plus into a wireless headset, connecting users wirelessly to a range of audio sources including TV, laptops, mobile and landline phones and other communication devices. A built-in telecoil allows the Ponto Streamer to pick up audio signals and send them directly to the sound processor so users can easily access loop systems in theatres, lecture halls and other public venues. Users can stream audio from remote microphones, which help in situations where the other person is far away or surroundings might be noisy, or both. The Ponto Streamer can also act as a remote control, creating an easy way for users to change programs or adjust volume, and built-in jacks allow simple connections to FM systems, music players and computers. Ponto Plus has been robustly designed to meet the challenges of active lives and everyday activities, and is IP57 certified. The durable and reliable design reduces wind noise and limits water, dust and debris from getting inside the processor. The housing is nano-coated to repel water. In addition to earning IP57 certification, Ponto Plus is now FDA cleared, CE marked and meets EU safety requirements. 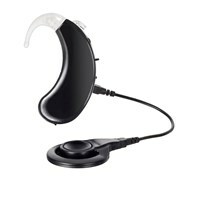 In 2009, Oticon Medical advanced bone anchored hearing systems into the world of digital hearing technology. With new Ponto Plus, Oticon Medical continues to be a pioneer in creating innovative patient-centered solutions that address everyday quality of life challenges. With the acquisition of Neurelec SA by parent company William Demant Group, Oticon Medical enters a strategically important growth area for hearing implant technology. Neurelec is a pioneer in cochlear implant technology that benefits people with severe to profound hearing loss. Cochlear implant technology represents a natural next step for Oticon Medical, a company that in just three years has captured nearly a quarter of the world market in bone anchored hearing solutions for conductive or mixed hearing loss and single-sided deafness. The integration of Neurelec’s cochlear implant expertise with Oticon’s strengths in audiology, signal processing and wireless technology creates the potential for highly innovative products. These synergies, combined with the considerable reach of Oticon Medical’s international distribution network, will increase the ability to bring treatment and successful outcomes to more patients than ever before. The acquisition of Neurelec provides a solid platform for continued growth that optimizes each company’s core competencies in their respective areas of implant hearing care. Neurelec, headquartered in Sophia Antipolis, France, has solid in-house R&D capabili-ties, state-of-the-art manufacturing facilities and a reputation for high quality cochlear implant technology. The two companies will work closely to develop synergies and the present Neurelec organization in France will be preserved. for cochlear implants that has shown annual growth of more than 10% in the past several years. The acquisition gives Neurelec access to valuable resources within the William Demant Group including capital investment in the development of enhanced implant hearing technology for severe hearing losses. As businesses within the William Demant Group, both companies will also benefit from Oticon’s established manufacturing and logistics infra-structure and 100-plus years of experience in audiology and sound processing and leadership in super power hearing solutions.